The employees of Hyundai Motor Manufacturing of Alabama donated more than 400 bicycles to the United States Marine Corps' Toys for Tots program on Wednesday. This is an annual tradition for Hyundai, and Senior Manager Kevin Graham says every year his team members line up to help out. 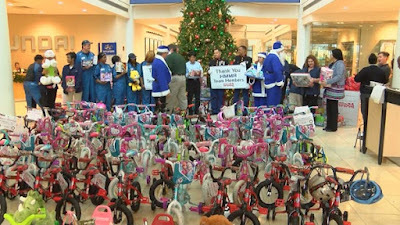 This year, the employees of HMMA stepped it up and donated 421 bicycles and several boxes of toys. That's 23 more bicycles than they gave last year. "It really speaks to the spirit of this company and the team members who make it up, that they're so willing this time of year to open their wallets and purses to provide this kind of donation," says Graham, who also tells us team members from every department contributed this year. First Sergeant Danny Langford with the Marine Corps was on hand to accept the donation. He says his unit is responsible for collecting toys for as many as 8,000 kids around the Montgomery area. Langford says with Hyundai's and other donations, they expect to have at least 20,000 toys by the end of Wednesday. He also says this one of their biggest years ever in terms of donations.